How many Registered Officers (RO) can there be for each entity? The number of Registered Officers (ROs) depends on your entity. CorpPass does not put a limit to the number. Refer to your entity’s UEN-issuance agency for RO requirements. The Registered Officer (RO) of my entity is unavailable, can someone else approve my registration? Yes. During the registration process, you may upload the 'Letter of Authorisation' template that is completed with the details of an alternate approver from your entity. The alternate approver should be a key executive officer who can act on behalf of your entity. Examples may include the CEO, Managing Director, or equivalents. Please note that the LOA must be signed be the approver, and uploaded together with a copy of the approver's identity document (e.g. NRIC / FIN / Passport). Applications using the LOA mode of approval will take at least five working days to be reviewed and approved by CorpPass. How does a Registered Officer (RO) approve a CorpPass Administrator (Admin) account? a. On the CorpPass website, access the ‘Services’ tab, and under the ‘Manage Admin’ function click on ‘Approve Admin Account’. b. Verify your identity by logging in to your SingPass account. c. View the table of request(s) pending your approval / rejection. d. Select the ‘Manage Request’ link next to the Admin you wish to approve. e. View and verify details of the registration request. f. Select the ‘Approve’ radio button. g. Click ‘Next’ to review the details and confirm the submission. h. Click ‘Submit’ to confirm the submission. For ROs who are NOT SingPass holders, the Admin will need to upload the Letter of Authorisation signed either by the RO or a Key Executive along with all supporting documents indicated in the Letter of Authorisation during registration. Additional documents may be required. In the event the deadline to approve an Admin account has passed (approval must be done within 30 days of the registration submission), the appointed Admin will be required to submit a new registration request to create a Admin account. Why do I see an error when trying to select the online mode of approval? The option available depends on the UEN-issuance agency your entity is registered under. How long does it take for the Registered Officer to provide online approval? Once the CorpPass Administrator (Admin) successfully submits his / her registration online, the Registered Officer may proceed to provide online approval. The online approval can be completed by the Registered Officer within 1-2 minutes. After which, the Admin may login to CorpPass. Please note that if you have selected the option to upload a 'Letter of Authorisation', CorpPass will take at least five working days to approve your Admin account. I have uploaded the 'Letter of Authorisation' as part of the online registration process. How long do I have to wait? Please note that if you have selected the option to upload a 'Letter of Authorisation', CorpPass will take at least five working days to approve your CorpPass Administrator account. My Registered Officer (RO) is currently overseas. Can he / she approve the request from overseas? Yes, your RO can approve the request while overseas by going to the CorpPass website, accessing the 'Services' tab, and under the 'Manage Admin' function, click 'Approve Admin Account'. Next, your RO will have to verify his identity by logging in to SingPass. He / she will then be able to view all outstanding requests pending his / her approval. Do note that he / she must approve the request(s) within 30 days from the registration date. In the event the deadline to approve a CorpPass Administrator (Admin) account has passed, the Admin will be required to submit a new registration for the account. I think my Registered Officer (RO) has forgotten about the approval of my CorpPass Administrator (Admin) registration. What do I do? System-generated email reminders will be sent to ROs every 5 working days. You can view the date of the last email reminder sent by accessing the Check Registration Status function with the registration’s Reference ID. You may also wish to remind your RO about the approval request requiring his / her action. Note that your RO must give approval within 30 days of the registration. If this deadline is missed, you will have to submit a new registration for an Admin account. The RO of my company is listed as a parent company rather than a person. How should I seek approval? Fully completed Letter of Authorisation. Ensure that your parent company’s RO is indicated as the Approver. Why was my CorpPass Administrator Account registration using Letter of Authorisation (LOA) rejected? CorpPass Administator Details provided in the LOA do not match the details provided in the online registration form. 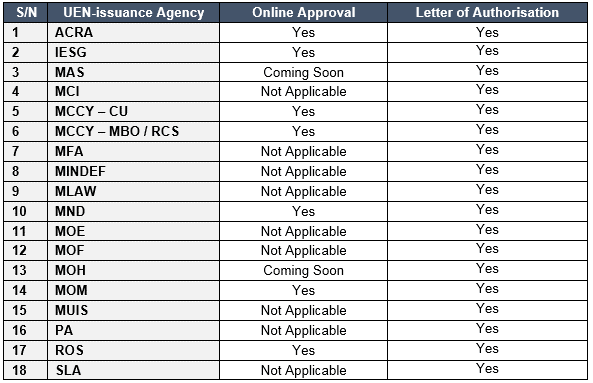 Entity Details provided on the LOA do not match with the details in the UEN-issuance agencies. You may double check your entity details through www.uen.gov.sg. Registered Officer (RO) who endorsed the LOA is not registered in the UEN-issuance agencies. RO's records are maintained by the UEN-issuance agency your entity is registered under. Approach the issuance agency to make changes. Alternative officer who endorsed the LOA does not hold key executive officer role who can act on behalf of your entity. Examples may include the CEO, Managing Director, or equivalents. Approver's copy of identity document is not submitted together with the LOA. Approver's identity cannot be verified. The CorpPass team reserves the right to reject applications for reasons it deems reasonably appropriate, including but not limited to cases mentioned above.